Nina O'Brien of Denver leans around a gate while competing in Thursday's Alpine combined event at the U.S. Alpine Speed Championships at Sugarloaf in Carrabassett Valley. O'Brien won, her second victory over the competition. Luke Winters of Gresham, Oregon, shows off his technique during the Alpine combined event on Thursday during the U.S. Alpine Speed Championships at Sugarloaf in Carrabassett Valley. 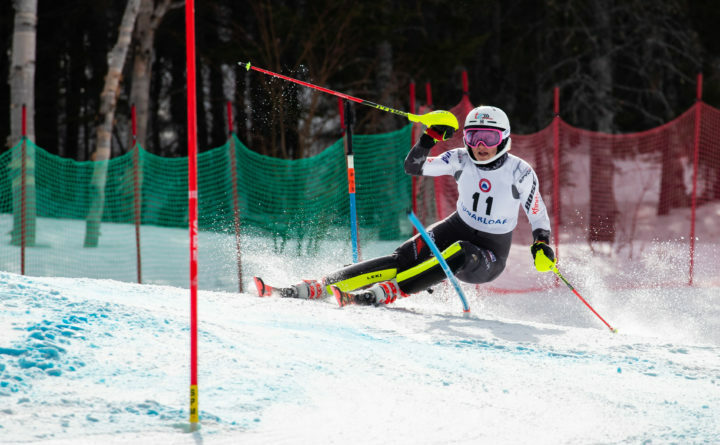 CARRABASSETT VALLEY, Maine — Nina O’Brien of Denver claimed her second national title of the 2019 US Alpine Speed Championships on Thursday, winning the Alpine combined event at Sugarloaf. 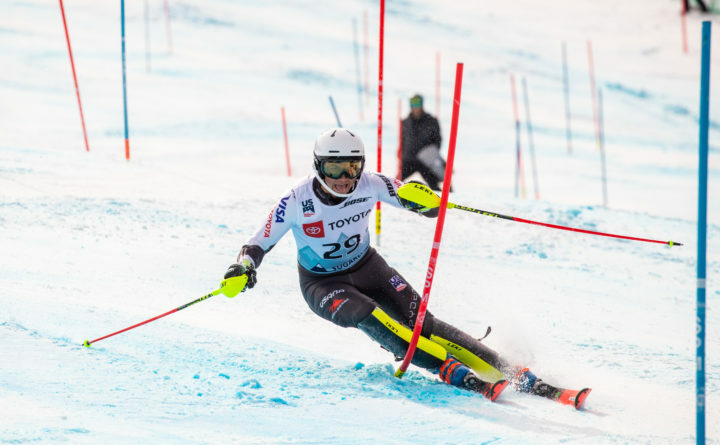 Following a second-place finish in the speed portion of the event, O’Brien threw down the fastest slalom run in the women’s field to earn the win with a combined time of 1 minute, 59.18 seconds. O’Brien also had claimed the Super G title on Wednesday. Teammates A.J. Hurt and Keely Cashman rounded out the women’s podium in the Alpine combined with finish times of 1:59.38 and 2:00.81, respectively. In the men’s division, Luke Winters earned the Alpine combined national crown with a time of 1:54.32. Canadian Jeff Read (1:54.75) was the runner-up and Kyle Negomire (1:55.01) placed third. On Wednesday, Ryan Cochran-Siegle of Stocksboro, Vermont, claimed his second title of the U.S. Alpine Speed Championships, winning the Super G in 1:10.79. Separated by just two-tenths of a second, teammates River Radamus and Tommy Biesemeyer rounded out the men’s podium in 1:11.48 and 1:11.68, respectively. After she narrowly missed the podium with a fourth-place finish on Tuesday, O’Brien threw down a blistering one-run time of 1:15.01 to defend her women’s Super G national title. She was followed closely by Hurt (1:15.20) and Cashman (1:15.64). Sugarloaf’s Sam Morse cracked the top 20 in 1:12.98. The U.S. Alpine Championships give up-and-coming athletes looking to advance their position on the U.S. Ski Team a chance to face off against A-Team stars. This is the seventh time Sugarloaf has played host to the championships, having previously done so in 1996, 1997, 2006, 2008, 2015, and 2017. This year marks the first time that the U.S. Alpine Championships have split speed and technical disciplines into separate events at different mountains. National championships in technical events will be contested March 23-26 at the U.S. Alpine Championships in Waterville Valley, New Hampshire.